In order to access MCAD servers from a Windows computer, you'll need to install and use a program called an SFTP client. We recommend the use of the free program FileZilla. FileZilla can be downloaded here. SFTP, or Secure File Transfer Protocol, enables secure file transfer capabilities between two networked hosts. This allows MCAD students, faculty and staff to access and upload files to MCAD servers from non-Apple computers. If you're on an Apple computer, you don't need an SFTP client to access MCAD servers - you can simply use our standard instructions for connecting to a server from a Mac. First, download FileZilla and install the program on your computer (detailed installation walkthrough here). Open FileZilla. This will bring up the Login window. Open the File menu in the upper left corner and choose Site Manager. Click New Site on the bottom-left of the window that opens. 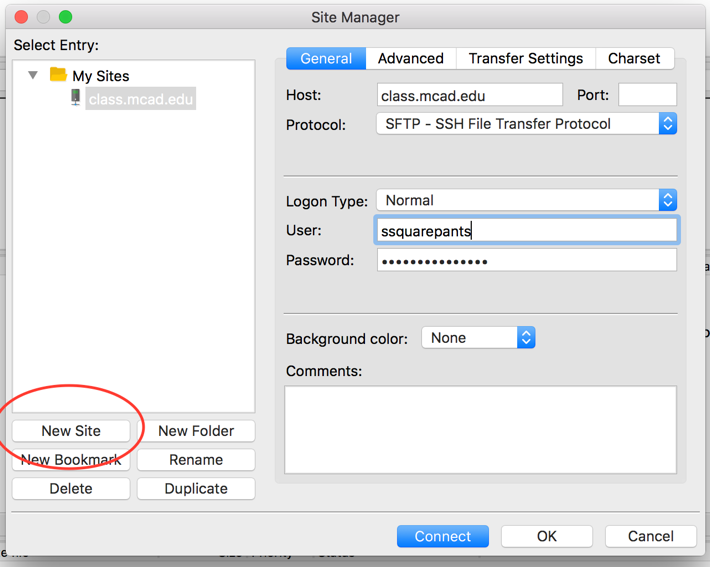 In the host field, enter the address of the server you wish to connect to (ex: "class.mcad.edu" or "department.mcad.edu"). Set the Login type to Normal. In the User field, enter your MCAD username (first initial last name). In the Password field, enter your MCAD login password (same as for your email). If this is your first time connecting, a window saying "Unknown host key" will pop up. Check the box for “Always trust this host, add this key to the cache” and click OK.
You should now be connected. On the right side of the window you'll see a list of folders on the server. You can open folders for which you have permission and drag and drop files to transfer data between your computer and the server. 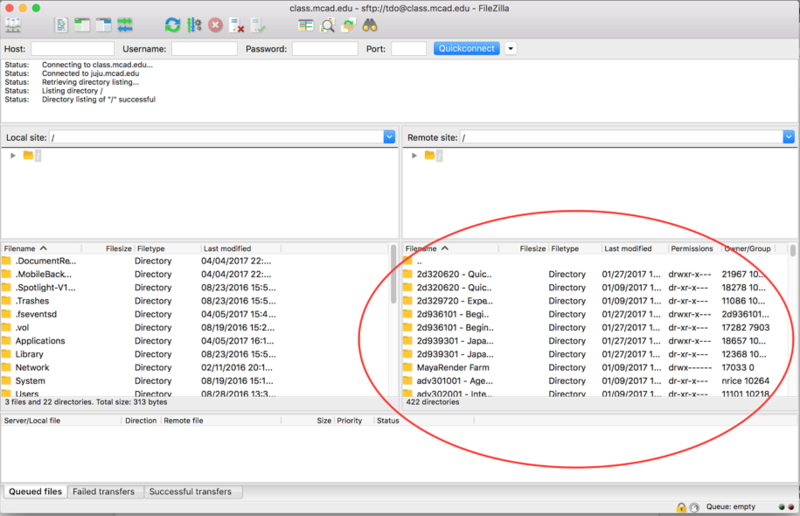 If you run into trouble or have questions, FileZilla's website has a detailed client tutorial and other documentation/FAQ. For further assistance, please feel free to email the Help Desk at helpdesk@mcad.edu, call us at 612-874-3666, or stop by during our hours.